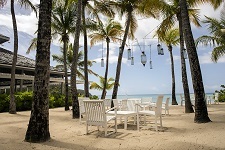 Carlisle Bay is a luxurious beach and spa resort located on the southern shore of the Caribbean island of Antigua. Situated overlooking white sand and tranquil turquoise waters, it is a small piece of paradise perfectly suited to seclusion and relaxation as it is to activities and exploring. The hotel has been named Antigua & Barbuda's Leading Resort 2018 at the World Travel Awards. 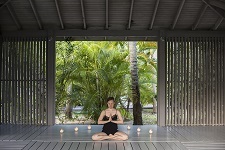 A visit to Blue Spa while visiting Carlisle Bay is a must for the ultimate holiday treat. Set in its own two-storey traditional Caribbean pavilion and covering 17,000 square feet Blue Spa has been designed to give space and ease to the body and soul. Blue Spa is proud to work with Voya–certified organic wild hand-harvested seaweed which is 100% Irish. Carlisle Bay boasts three bars and three exceptional restaurants: Indigo on the Beach offering healthy grills, seafood and salads, Ottimo! Serving the most delicious proposals from Italy, and East serving exciting pan-Asian food in a stunning setting. Other facilities include tennis courts, water sports centre, library, yoga pavilion, kids club and movie screening room. Staying at Carlisle Bay you will also be ideally situated to explore the fascinating Caribbean island of Antigua, both land and shore. 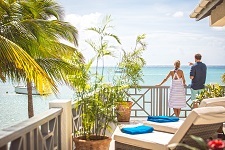 Carlisle Bay is a wonderful blend of West Indian and Western cuisine, hospitality, activity and leisure with a laid-back, unfussy atmosphere you will immediately fall in love with.